Re-launched on 14 November 2014, The Grill at The Dorchester boasts new timeless interiors and a new menu featuring grill favourites for breakfast, lunch and dinner. First established in 1931, The Grill at The Dorchester quickly gained a reputation as the place to be for the finest grill food in London. In keeping with this original concept we have created new seasonal menus. Delicious dishes range from grill favourites alongside the restaurant’s signature lobster chowder and an extensive sweet soufflé menu – the first of its kind in London. Counter top style seating and an open rotisserie will add to the lively and indulgently relaxed experience. Lively and welcoming, the re-imagined restaurant fuses The Dorchester’s iconic elegance with a contemporary tone and creative details by interior architect Bruno Moinard. Join us for our Grill Counter Wine Evenings featuring a wine and canapé journey covering six pairings from a different theme each month. We were a little worried by some mixed reviews but we needn't have been. Our dinner on Saturday evening was fabulous. Service, food, atmosphere were all better than we expected. We started with the lobster bisque and the fishcake and followed that with the ribeye from the grill and various sides. Unusually for us we also went for dessert with the souffle proving too difficult to resist. Two bottles of La Crema pinot noir later we finished the meal promising to return soon. Really very good indeed. Only very minor criticism is that there seemed to be only one card machine to take payment for the whole restaurant which meant we had to wait a while for other tables to finish paying. The Dorchester food, all of it, from room service to China Tang, the Promenade ---ALL of it is at an incredibly high level--and the Grill is no exception. It is quiet enough to have a real conversation, and the superb menu has food that is exquisitely prepared. Great wine list, with a wide list of good wines at all kinds of prices. This was my third meal there since they redid the place (prior to that, it had a distinctive breakfast room sort of feel)--each time superb. Best Sunday roast in the country. Food and service excellent. Staff are super professional but warm and friendly with it. A faultless meal - superb food, service and surroundings - highly recommended. The food was outstanding and the staff were very attentive and excellent, I heard that the Sunday Lunch is also outstanding and that is something I will be looking forward to. The dining experience was as good as ever. The food was excellent albeit expensive. The wine and drinks were seemless with the meal. We will be back! Have used the grill a number of times & it never disappoints, nice attentive staff but not overbearing at all. Chose the table d’hote menu for £39 for three courses and a glass of Laurent Perrier champagne. Limited menu with three choices for each course, one of which was the vegetarian option but food was beautifully presented and tasty. Lovely complimentary bread was offered several times. Waiting staff were friendly and attentive but very professional. It was sad that only three tables were occupied on a Tuesday lunchtime. Would recommend it for a relaxed lunch during a shopping day in London. 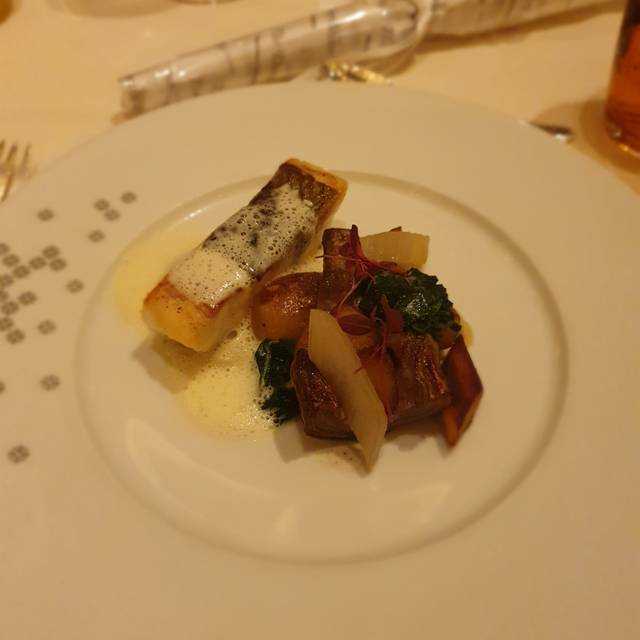 We eat in a lot of good restaurants in London and this was disappointing, the service was poor we didn’t receive all of our side dishes and our wine glass frequently went dry and we could not top up ourselves. Our empty dishes sat on the table for ages before they were cleared. Was very expensive for not great service. Will not be going back. I took my wife there to celebrate her birthday. We were both extremely pleased with every aspect of the occasion. Outstanding food, helpful and courteous staff, very pleasant ambience. I used to take my family to the Grill at the Dorchester for all special occasions and it was very special indeed. I have not been since the room was re furbished and it is now very disappointing indeed. It is no longer special and looks like many of your average restaurants in London. No table clothes and not very comfortable chairs. All rather second rate and not the Dorchester I remember. The food was what I would expect from a goodish London restaurant. The food we had did not match the bill I received. I am happy to pay the stupid prices if I get some really very good and special and we did not it was OK.
Great disappointment, how sad. Please make it a very special experience again and I will come back. PS I went to the Rib Room the following day and they still do lunch with style. Still silly prices but quite acceptable for that experience. A truly exceptional experience at The Dorchester for lunch. Service impeccable, food fantastic, ambience superb and very good value for money. I will be returning very soon and very regularly! 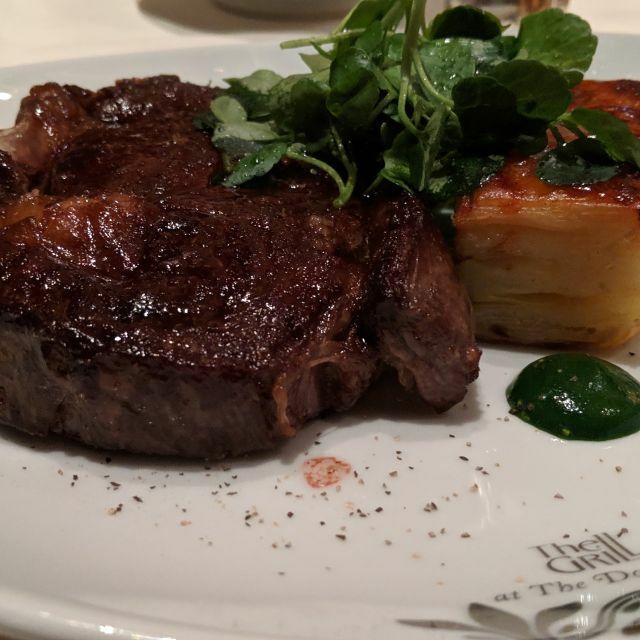 My husband and I still like to have "dates" together, even after 40 years of marriage and Saturdays lunch at The Dorchester Grill didn't disappoint us. We thoroughly enjoyed our lunch and the service was superb, obviously because the team were extremely well led and happy working together. We are looking forward to our next date! The group chose the fixed price menu. The starters were ok, nothing special. The fish was returned to the kitchen twice for being undercooked and then overcooked. I met with five long standing friends for lunch last Saturday and we were seated at a round table which was great. The food from the set menu was delicious and plentiful. The waiting staff and sommelier were very attentive and excellent at their jobs. Overall a very enjoyable experience I and would highly recommend. Easy to book and had a great time, very relaxing, not rushed, great service, food was excellent and staff were very welcoming, friendly and professional. Pleasant friendly experience. The set menu was adequate but not very adventurous. A huge disappointment – we were looking for a special treat had booked a table for breakfast at The Grill via OpenTable. My husband called to follow up and make sure breakfast was still served at 10:30. We were told it was. We arrived at 10:33 and were told the buffet was closed and breakfast was now only served in the lobby. Clearly there are no dining tables in the lobby. And without the buffet, it wasn’t quite the treat we were looking for and going to spend that much money on. Luckily the InterContinental down the road was only too happy to accommodate us. Much nicer dining room too. special and memorable. Having Sunday brunch at the Dorchester was correct and the right choice. Seeped in tradition yet not fussed and smoothness was our experience. It was a calming morning before we had to say our goodbyes. I hope that time at brunch was relaxing to him as its difficult for his parents. looking forward to returning and having a celebratory memory there. Fantastic service - not at all stuffy but friendly and professional. Leave some room for dessert as the pasty chef produces some out of this world concoctions! Very nice food. The service was truly efficient and courteous. Ambience was good. I was disappointed on this visit. The description of the beef on the menu was misleading, I was advised which piece of beef to choose and there was a lot of 'jelly'. The cost of the 2 course lunch is £29 & the 3 course lunch £39: I chose a sweet soufflé incurring a £3 supplement, thus the dessert cost £13. On the à la carte menu the soufflé cost £12! When I pointed this out, the bill was reduced accordingly, but not with any good will. There were no petits fours and £6 for a small Americano is ridiculous, even for the Dorchester. The bill arrived with Service charge added but no indication of what percentage had been applied. At the bottom it said 'Gratuity' with a space to add it on. That is disgraceful - if your English level meant that you did not know these were the same thing, you could easily end up unwittingly paying 30% upwards service charge! Top star venue...what an amazing meal and service was fantastic. Highly recommended. Have been to the Grill first time since it had been renovated. Great option for me as a vegetarian. Was pleased by the delicious various of vegitables and salads. My carnivore friends enjoyed their meat and fish:)). Great for the bussiness lunch. Definitely will come back again.